MAS F.L.A.G. Resin is a "medium" body resin specifically designed to perform as an adhesive and structural laminating foundation. The medium viscosity allows for the incorporation of fillers when fairing putties, gluing slurries and filleting systems are required. 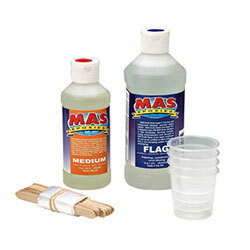 The Handy Repair Kit gives you a convenient amount of the MAS Epoxies 2:1 Non-Blushing System for small repairs and emergency needs. The kit includes FLAG resin, medium hardener, wood flour, mixing cups, mixing sticks and gloves, so you have everything you need right at your fingertips. *Glass Transition Temperature (Tg): The Glass Transition Temperature (Tg ) is one of the most important properties of any epoxy and is the temperature region where the polymer transitions from a hard, glassy material to a soft, rubbery material. As epoxies are thermosetting materials and chemically cross-link during the curing process, the final cured epoxy material does not melt or re-flow when heated (unlike thermoplastic materials), but undergoes a slight softening (phase change) at elevated temperatures.